Earlier this month, Paul had the opportunity to personally interrogate Pompeo at a Senate hearing. 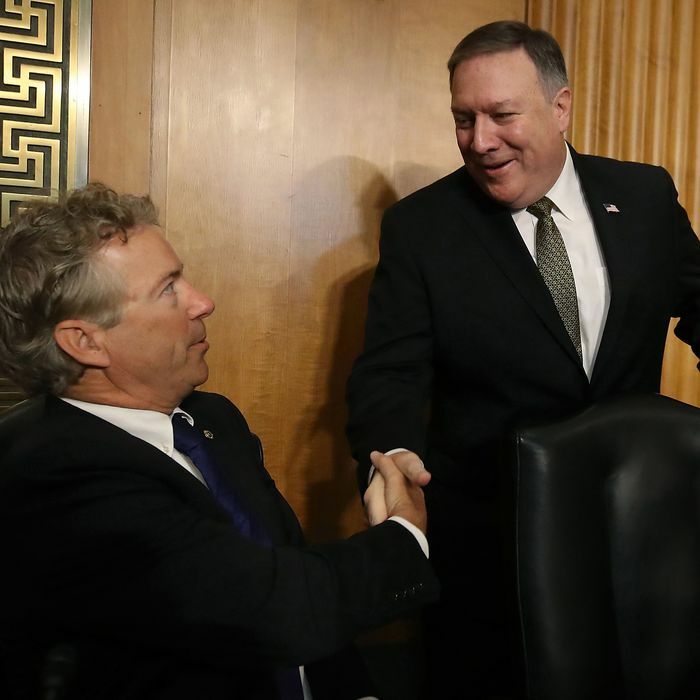 After that back-and-forth, the senator informed the CIA director that his pro-interventionist views on Iraq, Iran, Syria, and Afghanistan did not reflect those of “the millions of people who voted for President Trump.” Paul then reiterated his intention to oppose Pompeo’s promotion. This led political observers to assume that Paul would join the ten Democrats on the Senate Foreign Relations Committee Monday in voting down Pompeo’s nomination — delivering a rare rebuke to the neoconservative foreign-policy Establishment he opposes so courageously. But just before that vote was held, a miracle happened: Donald Trump informed Paul that Pompeo had finally realized the error of his ways, and adopted Paul’s anti-interventionist views on U.S. policy in the Middle East, thereby allowing Paul to do the GOP Establishment’s bidding with total integrity. President Trump believes that Iraq was a mistake, that regime change has destabilized the region, and that we must end our involvement with Afghanistan. But Paul’s estimation of Trump must have changed radically since then, just as his sense of Pompeo changed radically since this morning. The only alternative explanation for Paul’s actions would be that he is a total fraud, and that’s a bit hard to believe.